We have recently discovered granulocyte-colony stimulating factor (G-CSF) as an innate immune mediator that is upregulated by cocaine treatment, and correlates with the behavioral response to cocaine. Further studies have demonstrated that treatment of rodents with G-CSF results in enhanced neuronal and behavioral plasticity in response to cocaine. Our goal is to investigate whether manipulations in G-CSF function represent a tractable strategy for reducing the symptoms of drug addiction in human populations. Future efforts will work to clarify mechanistic details of how G-CSF affects brain reward circuitry to drive these changes. We are developing cell-specific manipulations of G-CSF function, using proteomics techniques to characterize synaptic changes, and applying an array of molecular biology and epigenetics methods to clarify the signaling pathways that are altered by this important signaling molecule. In recent years there has been a growing appreciation that the resident bacteria of the gut (the gut microbiome) can have profound effects on brain function and behavior. 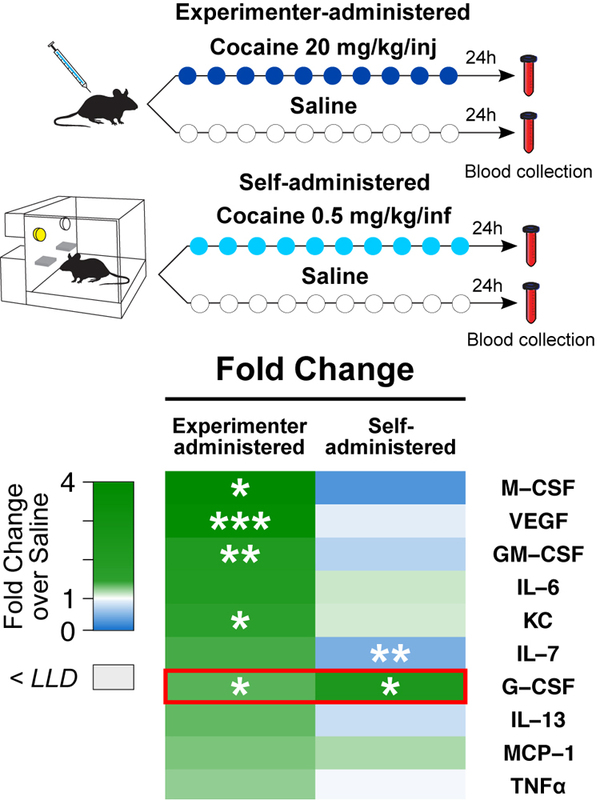 Recently, we demonstrated that alterations in the composition of the gut microbiome can affect the behavioral response to cocaine in animal models of addiction (Kiraly et al. Scientific Reports, 2016). Ongoing studies are examining the effects of antibiotics, prebiotics, and probiotics in animal behavioral models of opiate and psychostimulant addiction. These behavioral studies are being done in parallel with work characterizing how microbiome manipulations affect the molecular, cellular, and epigenetic response of limbic reward circuitry to drugs of abuse. In addition to this animal work, the lab is beginning a series of studies examining how opiate or cocaine use affects changes in the gut microbiome in human patients. The hope is that these studies will ultimately lead to clinical trials targeting manipulations of the gut microbiome to limit the propagation or development of addictive disorders. Of all the psychiatric disorders, there is perhaps the strongest evidence for a role of the gut microbiome in the development of autism spectrum disorder. The gut microbiota undergo large-scale changes during the first years of life on a similar timescale to the development of the symptoms of autism. Children with ASD have been reported to have changes in their gut flora, frequently have gastrointestinal symptoms, and there are even anecdotal reports of some symptoms improving after treatment with antibiotics. To investigate the mechanistic role that the gut microbiome might be playing in the development of autism, we are performing manipulations of gut bacteria in an animal model of Phelan-McDermid Syndrome (Shank3KO mouse). These studies will allow us to directly investigate a gene x microbiome effect on behavior and neurobiology. Through the Seaver Autism Center we are also actively recruiting patients with Phelan-McDermid Syndrome to see how their gut flora may differ from that of non-affected children. These studies may pave the way for development of therapeutics targeting the gut microbiome to alleviate the symptoms of this often debilitating condition.